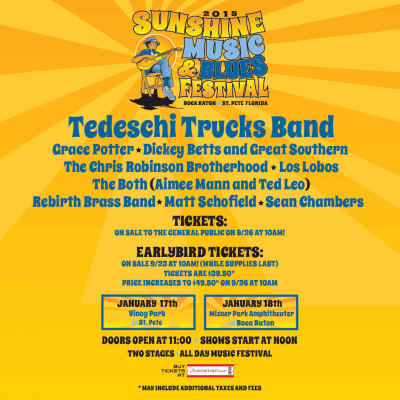 Sunshine Music and Blues Festival is coming back to Florida! Featuring Grace Potter and the Nocturnals, Dickey Betts, Chris Robinson Brotherhood, Los Lobos, The Both (Aimee Mann and Ted Leo) and many more, this year's festival promises to be one of the most exciting and eclectic musical experiences of the year. Join us at Vinoy Park in St. Pete on January 17 and Mizner Park Amphitheatre in Boca Raton on January 18. Tickets are available beginning on Friday, September 26 at 10am.